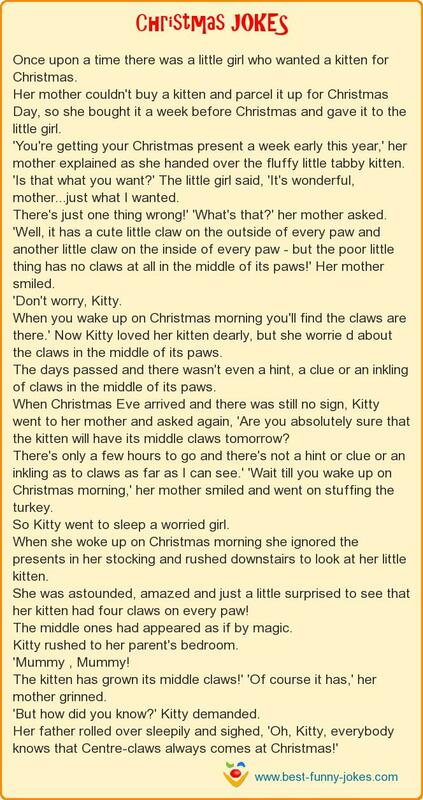 Once upon a time there was a little girl who wanted a kitten for Christmas. Her mother couldn't buy a kitten and parcel it up for Christmas Day, so she bought it a week before Christmas and gave it to the little girl. 'You're getting your Christmas present a week early this year,' her mother explained as she handed over the fluffy little tabby kitten. 'Is that what you want?' The little girl said, 'It's wonderful, mother...just what I wanted. There's just one thing wrong!' 'What's that?' her mother asked. 'Well, it has a cute little claw on the outside of every paw and another little claw on the inside of every paw - but the poor little thing has no claws at all in the middle of its paws!' Her mother smiled. When you wake up on Christmas morning you'll find the claws are there.' Now Kitty loved her kitten dearly, but she worrie d about the claws in the middle of its paws. The days passed and there wasn't even a hint, a clue or an inkling of claws in the middle of its paws. When Christmas Eve arrived and there was still no sign, Kitty went to her mother and asked again, 'Are you absolutely sure that the kitten will have its middle claws tomorrow? There's only a few hours to go and there's not a hint or clue or an inkling as to claws as far as I can see.' 'Wait till you wake up on Christmas morning,' her mother smiled and went on stuffing the turkey. So Kitty went to sleep a worried girl. When she woke up on Christmas morning she ignored the presents in her stocking and rushed downstairs to look at her little kitten. She was astounded, amazed and just a little surprised to see that her kitten had four claws on every paw! The middle ones had appeared as if by magic. Kitty rushed to her parent's bedroom. The kitten has grown its middle claws!' 'Of course it has,' her mother grinned. 'But how did you know?' Kitty demanded.